Turkey Pie: Well Hello There, Friends! Turkey Pie is back for a 2nd summer of fun! As usual, we can't promise original ideas, but we can promise inspiration. We hope the fun things we do this summer help you figure out fun things to do with your little turkeys. Sydney and Brenna are so pumped for summer this year. Not only because we've got trips, learning adventures, beach extravaganzas... and even a trip to Europe planned, but because...... drumroll.... Daddy's coming home from deployment in the middle of July! 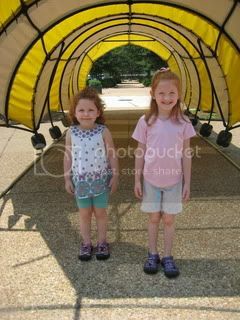 First up for the girlies, is a fun "camp" at our local museum. We happen to be members, so we get a newsletter each month. In one of these I happened to notice they were offering kids classes. We decided on The Littlest Naturalists Meet Creatures of Confusion, where they are learning about moths vs. butterflies/ spiders vs. insects/whales & other mammals, etc. It meets daily for a week, from 1:30 to 4p.m. And because we're members, we got a nice discounted rate. We live in a great area for classes/camps. Check out your local art studios, gymnastics places, art, science, children's or learning museums and see what fun things they have planned. And do it fast, those spaces fill up quickly! If you haven't already gone in search of Kid's Day Out programs at your local churches, that's a thought too. We are continuing our gymnastics classes through June, and we have 2 soccer games left, so we are plenty busy already. And that's how we like to stay.